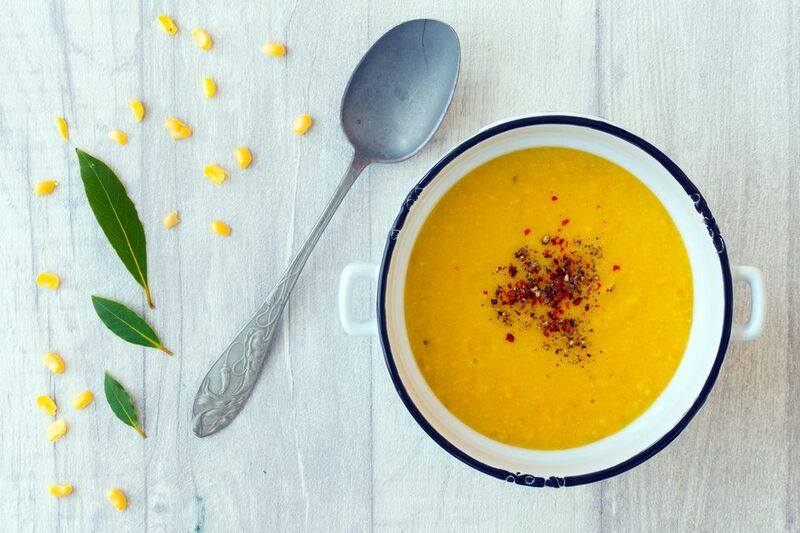 Brighten up the day with a super delicious and easy corn soup that can be made any time of the year. In the summertime when corn is at its peak, you can use fresh kernels, but frozen corn also works in the middle of winter. Even better, you can adjust this basic recipe—which on its own is already really lovely—into many more great soups. Take a look at the suggestions below the recipe. If using fresh corn, check out the kitchen notes below on how to quickly remove kernels from the cob. Start by melting the butter and the olive oil together in a large saucepan or Dutch oven. Add the chopped onion and cook on low heat for 5 minutes until the onion begins to soften. Add the minced garlic and cook for 5 more minutes, stirring from time to time. Add the sweet corn kernels to the pan and stir, then add the chopped baking potato and stir again. Cook for two minutes, then add the bay leaves and the stock. Bring to a gentle simmer and cook uncovered for 20 minutes until the potato is soft. Remove the soup from the heat, leave it to cool for 2 minutes, then blend the soup with a stick blender until silky and smooth. Bring the soup back to a gentle simmer, taste and add salt as needed. Ladle the soup into warmed bowls and garnish with chili flakes (if using) and black pepper. Serve while hot with crusty bread and butter. If you are using fresh corn, removing the kernels from the cob is easy, but you will need a sharp knife. Slice one end of the cob to create a level surface to stand the corn upright on a chopping board. Slice down the sides of the cob, under the kernels to remove them. Add finely chopped cooked chicken breast, stir through the hot soup before serving and cook over a gentle heat until the chicken is heated through thoroughly. Stir finely chopped fresh herbs through the finished soup before serving; parsley, chervil, tarragon will all make perfect partners to the soup. Garnish with chopped fried pancetta. Keep a handful of corn kernels to one side. Before serving the soup, heat a frying pan over medium heat, add the corn to the hot, dry pan and cook until toasty and brown. Sprinkle over the finished bowls.